Then up rose Mrs Cratchit, Cratchit’s wife, dressed out but poorly in a twice-turned gown, but brave in ribbons, which are cheap and make a goodly show for sixpence; and she laid the cloth, assisted by Belinda Cratchit, second of her daughters, also brave in ribbons; while Master Peter Cratchit plunged a fork into the saucepan of potatoes, and getting the corners of his monstrous shirt collar (Bob’s private property, conferred upon his son and heir in honour of the day) into his mouth, rejoiced to find himself so gallantly attired, and yearned to show his linen in the fashionable Parks. And now two smaller Cratchits, boy and girl, came tearing in, screaming that outside the baker’s they had smelt the goose, and known it for their own; and basking in luxurious thoughts of sage and onion, these young Cratchits danced about the table, and exalted Master Peter Cratchit to the skies, while he (not proud, although his collars nearly choked him) blew the fire, until the slow potatoes bubbling up, knocked loudly at the saucepan-lid to be let out and peeled. `Here’s Martha, mother.’ said a girl, appearing as she spoke. `Why, bless your heart alive, my dear, how late you are.’ said Mrs Cratchit, kissing her a dozen times, and taking off her shawl and bonnet for her with officious zeal. `Why, where’s our Martha.’ cried Bob Cratchit, looking round. `Not coming,’ said Mrs Cratchit. `And how did little Tim behave. 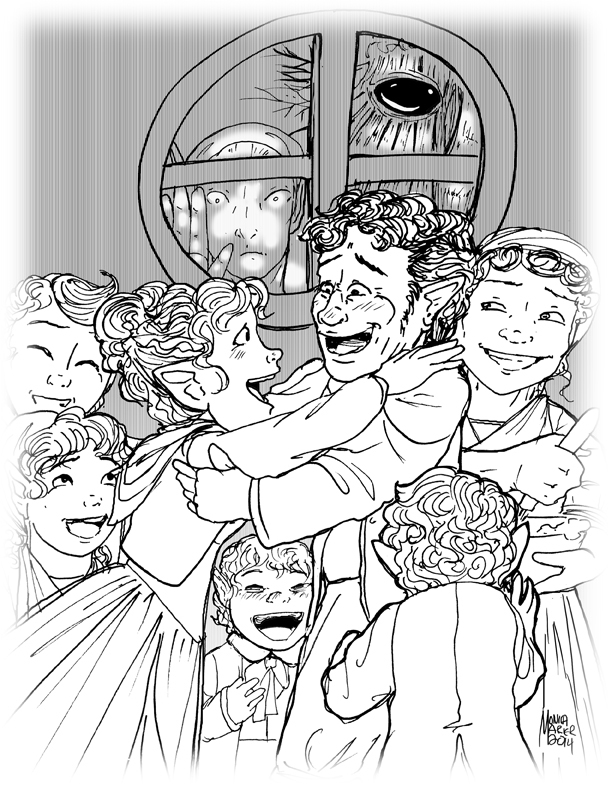 asked Mrs Cratchit, when she had rallied Bob on his credulity, and Bob had hugged his daughter to his heart’s content. Such a bustle ensued that you might have thought a goose the rarest of all birds; a feathered phenomenon, to which a black swan was a matter of course — and in truth it was something very like it in that house. Mrs Cratchit made the gravy (ready beforehand in a little saucepan) hissing hot; Master Peter mashed the potatoes with incredible vigour; Miss Belinda sweetened up the apple-sauce; Martha dusted the hot plates; Bob took Tiny Tim beside him in a tiny corner at the table; the two young Cratchits set chairs for everybody, not forgetting themselves, and mounting guard upon their posts, crammed spoons into their mouths, lest they should shriek for goose before their turn came to be helped. At last the dishes were set on, and grace was said. It was succeeded by a breathless pause, as Mrs Cratchit, looking slowly all along the carving-knife, prepared to plunge it in the breast; but when she did, and when the long expected gush of stuffing issued forth, one murmur of delight arose all round the board, and even Tiny Tim, excited by the two young Cratchits, beat on the table with the handle of his knife, and feebly cried Hurrah. There never was such a goose. Bob said he didn’t believe there ever was such a goose cooked. Its tenderness and flavour, size and cheapness, were the themes of universal admiration. Eked out by apple-sauce and mashed potatoes, it was a sufficient dinner for the whole family; indeed, as Mrs Cratchit said with great delight (surveying one small atom of a bone upon the dish), they hadn’t ate it all at last. Yet every one had had enough, and the youngest Cratchits in particular, were steeped in sage and onion to the eyebrows. But now, the plates being changed by Miss Belinda, Mrs Cratchit left the room alone — too nervous to bear witnesses — to take the pudding up and bring it in. Suppose it should not be done enough. Suppose it should break in turning out. Suppose somebody should have got over the wall of the back-yard, and stolen it, while they were merry with the goose — a supposition at which the two young Cratchits became livid. All sorts of horrors were supposed. Hallo. A great deal of steam. The pudding was out of the copper. A smell like a washing-day. That was the cloth. A smell like an eating-house and a pastrycook’s next door to each other, with a laundress’s next door to that. That was the pudding. In half a minute Mrs Cratchit entered — flushed, but smiling proudly — with the pudding, like a speckled cannon-ball, so hard and firm, blazing in half of half-a-quartern of ignited brandy, and bedight with Christmas holly stuck into the top. `God bless us every one.’ said Tiny Tim, the last of all.